After my mother passed away, the following Precious Moments remained from her Card and Gift shop. 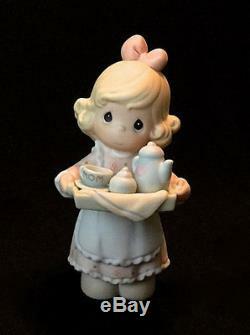 Even though they are a commodity, Precious Moments have sentimental value because they are divinely inspired and thus spread hope to anyone who invites them into their homes.... New in Box but please remember that some of these figurines are 20, 30 and 40 years of age. Exterior box conditions will vary. Stored in a Smoke Free Environment Card and Gift shop closure. If you are interested in ordering just a select few, please use the "Make an Offer" button and list the names of the figurines you are interested in. The Precious Moment item number, Name and Quantity available are listed below. 12386 Lord Give Me a Song - 1. 104800 You're a Perfect 10(Gymnast) - 1. 108522 Your Love Fills My Heart - 2. 108528 My Most Precious Moments are With You - 1. 109924 Wishing You a Basket Full of Blessings(Easter) -1. 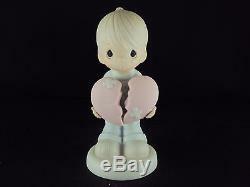 111870 Mommy's Little Angel(Blond) -1. 112313 A Tub full of Love - 1. 114014 This too shall pass - 1. 129119 He Graces the Earth With Abundance(4 Seasons series) - 3. 176958 Some Plant, Some Water, But God Giveth the Increase - 1. Anyway(1996 Annual Edition) - 1. 192368 Give Ability a Chance(Special Olympics commemorative) - 1. 261084 You Have Touched So Many Hearts - 3. 261122 Lettuce Pray - 1. 261130 HAve any Room for Jesus - 1. 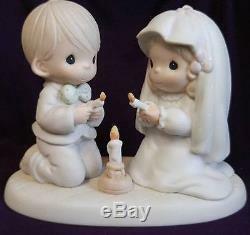 272531 Sharing The Light of Love - 2. 272558 I Think You're Just Divine - 1. 272590 I'm Dreaming of a White Christmas - 1. 272671 Cane You Join Us for a Merry Christmas - 1. 325309 Only One Life to Offer - 2. 325473 Mom, You're my Special Tea - 4. 455768 Peas on Earth - 2. 455814 Wishing You a Yummy Christmas - 2. 455849 Time for a Holy Holiday -1. 455873 Have a Cozy, Country Christmas - 1. 455938 I Now Pronounce You Man and Wife - 2. 456314 Heaven Bless You(Easter Seals) - 2. 487929 You're my Honey Bee - 1. 487953 You Can Always Count on Me - 2. 487988 What Better To Give Than Yourself - 1. 488321 You Can't Take it with You - 2. 488372 You Count - 1. 490318 God Knows Our Ups and Downs - 4. 520764 Puppy Love - 1. 520829 You are my Number One - 1. 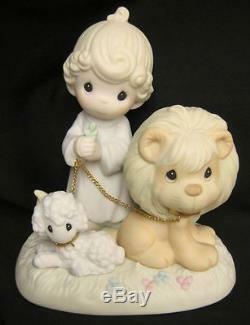 520837 The Lord is Your Light To Happiness - 1. 520845 Wishing You a Perfect Choice - 1. 520918 Bless Be the Tie that Binds - 2. 521477 Tell it To Jesus - 3. 521701 Shoot 4 the Stars and You'll Never Strike Out(Boys and Girls CLub) - 1. 521701 Shoot 4 the Stars and You'll Never Strike Out(Boys and Girls CLub) - 1 no box. 522325 Somebody Cares - 3. 522864 Just a Line to Say You're Special(Fisherman) - 1. 523453(Brown hair) - 1 No box. 523518 God is Love Dear Valentine - 1. 523615 Good News is So Uplifting - 1. 523739 Time Heals - 1. 523755 Just puppin in to say Halo - 3. 524204 Love is Color Blind(Boys and Girls Club commemorative) - 2. 524212 Walk in The Sunshine - 2. 524395 You're Such a Perfect Friend - 1. 524425 May Only Good Things Come Your Way - 2. 526037 A Prince of a Guy - 1. 526142 I Would Be Lost Without You - 1. 526193 You Suit me to a Tee(Golfer) - 1. 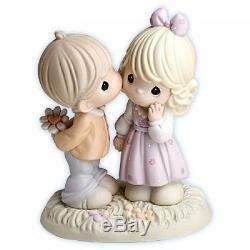 526487 Sharing Sweet Moments Together - 2. 527637 Waiting For a Merry Christmas - 2. 528633 To a Very Special Sister - 2. 529273 My True Love Gave to Me - 1. 530018 Wishes for the World - 8. 530999 I Still Do - 1. 531022 Potty Time(toilet training) - 1. 531057 I Haven't Seen Much of You Lately(Addition to Birthday Series) - 1. 531138 What a Difference You've Made in My Life - 1. 531944 Sharing Our Christmas Together - 2. 532061 Who's Gonna Fill Your SHoes - 1. 532126(Brown hair) - 1 No box. 587907 My Life is a Vacuum without You - 1. 587983 God Loves a Happy Camper - 2. 604208 A Poppy for You - 1. 644463 You Color Our World with Loving, Caring and Sharing(Artist) - 2. 650013 Giving My Heart Freely - 4. 679828 Good Advice Has No Price - 1. 679844 We Kneed You, Grandma - 1. 679852 This Day has been made in Heaven - 4. 679879 Bless You - 3. 681059 Let Freedom Ring - 7. 681067 You Complete My Heart - 1. 689548 You Have the Sweetest Heart - 1. 692409 Alleluia He Has Risen - 2. 730130 Raisin' Cane on the Holidays - 2. 731064 Take Thyme For Yourself - 4. 737550 Sure Could Use Less Hustle and Bustle - 1. 742872 You're a Real Barbe-cutie - 2. 742880 To the Sweetest Girl in the Cast - 4. 745510 Chicken Soup for the Soul includes Hardcover book entitled Another Sip of Chicken Soup for the Soul. 795151 You are the Queen of My Heart - 1. 795267 You are the Wind Beneath my Wings - 2. 795275 You're as Sweet as Apple Pie - 3. 795283 You're a Honey - 1. 798223 Grandma I'll Never Outgrow You - 1. 879002 Roll Away Roll Away Roll Away(Girl Rollerskater) - 3. 879126 Lord Let Our friendship Bloom - 1. 890626 You Have a Heart of Gold - 1. 898457 You are my Favorite Dish(Chef) - 1. 898457S You are my favorite dish - 2 LIMITED EDITION. E-0007 Sharing is Universal - 1. E-1372/B Jesus Loves Me - 1. E-1374/G Make a Joyful Noise - 2. E2353 O Come All Ye Faithful - 1. E-2825 To a Very SPecial Sister - 1. E2831 Bridesmaid(Wedding Collection) - 2. E2832 God Bless the Bride(Wedding Collection) - 2. E2835 Flower Girl(Wedding Collection) - 3. E2836 Best Man (Wedding Collection) - 2. E-2837 Groom(Wedding Collection) - 1. E-2845 Junior Bridesmaid(Wedding Collection) - 2. E2846 Bride(Wedding Collection) - 2. E2854 God Blessed Our Years Together with So Much Love and Happiness(1st Anniversary) - 1. E2857 God Blessed Our Years Together with So Much Love and Happiness(25th Anniversary) - 2. E2860 God Blessed Our Years Together with So Much Love and Happiness(50th Anniversary) - 3. E-3106 Mother Sew Dear - 1. E-3109 The Purrfect Grandma - 1. E5213R God is Love -10. 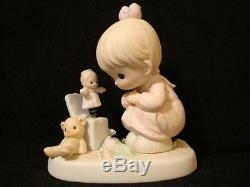 The item "219 Precious Moment figurines Bulk Sale New in Box Make Offer BIN Bonus" is in sale since Tuesday, May 8, 2018. This item is in the category "Collectibles\Decorative Collectibles\Decorative Collectible Brands\Precious Moments\Figurines\Other Precious Moments Figures". The seller is "jackie-of-all-trades-master-of-none" and is located in Anaheim, California.